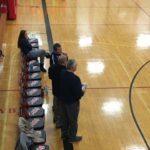 Marquette, MI – February 1, 2018 – The Marquette Redettes basketball team defeated the Westwood Patriots 41-29 on Thursday night, in a game that was broadcast live on Fox Sports Marquette 105.1-99.9 and online at foxsportsmarquette.com. The Redettes, who came into the contest having won their previous two, got the win against the Patriots and stretched their unbeaten streak to three games. The game began at a fast pace, with both teams getting on the board within thirty seconds of the opening tip. 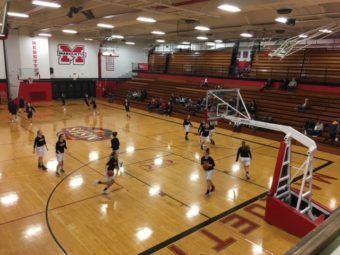 The lead went back and forth multiple times in the opening quarter, but after one, it was the Marquette Redettes on top 11-10. This razor-thin margin was indicative of the competitiveness with which the game was played, and throughout most of the first half you’d be hard-pressed to determine which school was the better side. Marquette was able to build up a respectable lead by halftime, and at the break, the Redettes held a 20-14 lead. After the resumption of play Marquette put on a tremendous display of defensive prowess, holding Westwood scoreless for the first four minutes of the third quarter. 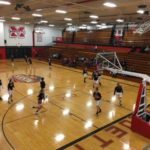 Marquette outscored the Patriots 10-5 in the penultimate frame, and going into the final quarter, the Redettes led Westwood 30-19. The Patriots were far from done, however, and came out hard in the fourth quarter. Westwood’s defense didn’t allow Marquette to score in the opening four minutes of the final stanza, while the Patriots scored four of their own in the same span. 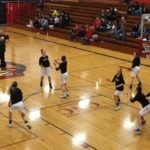 Westwood couldn’t maintain this run of offensive form, however, and the Marquette Redettes came out the victors by a score of 41-29. Leading the way offensively for Marquette was the tandem of Claudia Hale and Stasha Warchock, each of whom put up 10 points. For Westwood, the leading scorer was Madelyn Koski with 13 points. 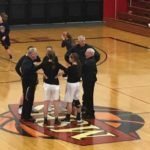 The Marquette Redettes will next take the court on Tuesday, February 6, when they host the Houghton Gremlins. That game will start at 7:15 P.M., and you can catch all the action on 97.5 GTO and online at gto.fm.